What rocket engine is totally silent at 1000 lb of thrust? A fake one. As seen in the Apollo movies. How much noise can you expect to hear in a vacuum? I wonder if this latest nugget can offer some insight into why turbs may not be able to actually hear any counter arguments. Turbs, any noise audible within the cabin might be minimal at best...plumbing sounds, valves opening (the ascent engine was pressure fed, no pumps). Maybe some vibration noises, but again the noise cancelling mikes wouldn't transmit that. You said that the figures you were quoting were "about the knee flexion of sitting in a chair". Why, then, does it apply to someone bending down to pick something up? Look - just forget the chair entirely, okay? There is an addendum to the table which describes some of the test data as being incomplete! How can you possibly describe that as hiding and expect to be taken seriously??!! The problem is, you're using it as an excuse for not addressing the EXISTING data in that table! Which means, you are hiding from it. The table is over 90% COMPLETE, You cannot ignore that data. So please stop the excuses, and deal with it. The big problem I see is that neither Suit B nor Suit C were the Apollo proto-type suits. That was suit A.
Because,,,,there is no knee flexion data for Suit A, right? Whie we don't have the knee flexion data for Suit A, we do have it for Suit B and Suit C. In each case, the figures are about 40 degrees less than the table you cite. If we extrapolate for Suit C, the 145 degrees (you claim is knee flexion) gives us ~100% knee flexion. .
You're comparing a mobility test to a test done while seated! So now it's just "a test"? You really do try anything to dismiss this table, don't you? . "TABLE XIII. ANGULAR DATA FOR JOINT MOBILITY AND SUIT-JOINT INTERFACE"
As for the test being done "while seated", exactly what are you referring to? Sound is a wave which registers in the ear after the wave is transmitted through a medium. Like the medium we call 'air', of course..
Like the medium we call 'space', of course. Thus a rocket engine in vacuum makes no discernible sound out in the vacuum. We have air in a capsule, so we know that sounds can be heard in the capsule. The capsule may be in the vacuum of space, but there is air inside the capsule itself. Sounds are heard in the medium of air. I think you should, because it isn't helping your case. Oh, I don't have problems with the "chair". Nither do I have a problem with the mobility data. Seems you do though. The existing data supports the fact that the prototype Apollo suit could bend at the knees up to 145 degrees. No. I'm saying the data for suits B & C isn't relevant to the knee flexion of the Apollo suit. Ignore it? The data supports my case, and destroys yours! 145 degrees in the mobility table analysis! No more excuses please! Deal with it! Not from the X-ray study. But we do have the knee flexion-extension measurement from the mobility table study, which clearly shows the knee can flex up to 145 degrees. Whie we don't have the knee flexion data for Suit A, we do have it for Suit B and Suit C. In each case, the figures are about 40 degrees less than the table you cite. 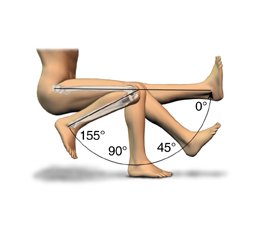 If we extrapolate for Suit C, the 145 degrees (you claim is knee flexion) gives us ~100% knee flexion. For starters, you can't extrapolate data that way as the suits are different and behave differently. Your trying to invent data that isn't there. Secondly, those measurements were taken while seated. The mobility table data destroys your argument, so it's no wonder you keep avoiding it. Oh dear. This is getting excruciating. They are measuring the angle difference between "knee flexion" and "knee extension". If this diagramme doesn't drop the penny, you're beyond help on this one. Or perhaps you can explain exactly what angle the 145 degrees refers to? Knee flexion-extension is the angle measured between the knee being fully flexed, and fully extended. Didn't you say previously, it was done while seated? You clearly have no argument and are resorting to inane nit-picking. Address the data please. 145 degrees knee flexion-extension. Oh and try to do it without presenting your inability to measure an angle to the world. Strictly speaking, it wasn't a 'chair'. It was a mock-up of the Apollo couch. As interesting (or not) as this discussion is, you're guilty of your old tricks: reversing the burden of proof. You have no evidence whatsoever to back up your initial claim, so once again you're nit-picking around the edges of hard data to try and claim some kind of moral victory. "The SAS suit has greater mobility than the Apollo suit, ergo it should have greater knee flexion". It's been explained to you why you're wrong. If you have nothing else to add, then as far as I'm concerned, this particularly dead donkey no longer needs flogging. The carcass stopped twitching a long time ago. One that was operating in a vacuum maybe? Recorded using microphones designed to pick up as much speech and as little background noise as possible? I am surmising that he's addressing that tired old ancient silliness he did long ago, where he asked why the engine wasn't heard during the LM descent (or any other time an engine was operating while they were in space....). I could tell you that Posty is correct...Any nominal sound or vibration passed through the medium of the cabin atmosphere wouldn't be heard through the microphione, which, set to vox mode, only transmitted when the proximity sound of the voice triggered the mic open. Any other sound outside the sealed helmet wouldn't have triggered the mic. I though this was clear long ago (it was, of course), but you like re-hashing old dead ideas, and thoroughly seem to enjoy making them sound as if they're somehow fresh and significant. If a tree falls in the forest, and there's no one there to hear. Does it make a sound? If a rocket engine fires in a vacuum, regardless of whether anyone is there, does it make a sound? "I grew up during the Cold War and considering the mindset of the former Soviet Union during the Apollo moon flights, there was ABSOLUTELY NO WAY they would have allowed us to get away with a moon hoax and yet, they confirmed the United States sent men to the moon. The reaction of the Soviet Union exposing hoaxed Apollo moon flights to the whole world would have been like throwing a pound of meat in the middle of a shark feeding frenzy and yet, they confirmed that we landed men on the moon"..
]I grew up during the Cold War and considering the mindset of the former Soviet Union during the JFK murder, there was ABSOLUTELY NO WAY they would have allowed us to get away with our own government killing the President and yet, they did. The reaction of the Soviet Union exposing the US Government as murderers of their own President to the whole world would have been like throwing a pound of meat in the middle of a shark feeding frenzy and yet, they said and did absolutely nothing. Well, yes, I think most of us do get it. 1. What would make you think the USSR would care if the US Government Killed it's Chief Executive? 2. Prove they would've cared. 3. Oh yes, prove that the Government did kill President Kennedy, as you are wont to declare as if it's established fact (like the ridiculous Moon Hoax you allege without a shred of subtsantive proof).). These questions actually expect no answer of substance, since you can prove none of what you allege here. JFK has nothing to do with the "Moon Hoax". If you are itching to answer any of this, that's for another thread. Right here, we wait...well, some of us do! I'm not saying that. Never did, What gave you this idea, anyway? I'm a bit curious. It is not relevant to my issue, and it never will be. Very little you post actually relates to your real issue. ...proving you case.--the real issue you have here. The chair was just a prop, if you will, so everyone can visualize a knee flexion of approx. 90 degrees. You can forget the Apollo spacesuit argument because you've lost that case a long time ago, which is one reason why no one takes you seriously. Is there any good explanation for this? Because I'm honestly baffled. All I've seen are people attacking the integrity of the guy who made the movie, but no proper debunking. Any ideas? There is a good explanation. Thanks a lot man, I was getting a little worried there. No problem Sean, happy to help. If you search the thread for "window" you'll find several discussion points on this that have been gone over previously. That video makes for a great summation of the key points though, and I was able to share it with you courtesy of a prior post from frenat. It is also worth noticing that Jackdaw claims people are more questioning of the truth now than they were in the 60's. Given that I'd like to see his explanation for the percentage believing in Apollo actually rising (albeit marginally) with each poll. Can you produce those poll results please. What exactly do you think that will achieve? Since when is scientific truth determined by an opinion poll? It is determined by the weight of evidence. That evidence convinced all the relevant authorities of the authenticity of the Apollo landings more than 4 decades ago. Since that time there has been not a single piece of evidence which has cast doubt on the authenticity of Apollo. Not one. If you think a poll will help feel free, start one. But maybe you should know the results of the previous polls on this subject before you do so. This poll from 2003: http://www.unexplain...=1 found that over 63% of members that voted believed the landings to be genuine. Those that voted against include 12.2% that agreed landings were impossible because the moon is made of cheese. There is this poll from 2005: http://www.unexplain...6&mode=show&st= found that nearly 66% of members that voted believed that the landings were genuine. Those that disagreed included10% that voted for a totally blank option. Then there is this poll from 2006: http://www.unexplain...pollo hoax&st=0 here 68% believed that the landings were genuine. Now given that this is not a scientific site, encourages alternative views and has a very active conspiracies section I would expect a higher level of belief in the hoax theory than in the population at large. Hmmm? 2006 polls aint now as mr WD said. Feel free to start a poll then, if you think it will prove something. BooNy, Jackdaw can't be bnothered to even attempt to back up the willfully ignorant, demonstrably false and almost certainly fabricated claims he makes. What makes you think he'd take the time to start a poll....? I'm not expecting him to, but considering that Waspy had already told him to feel free I thought it was kind of stupid for him to complain about it at this point. The pics of the fake moon landings are widely covered on the net for all to see. Including the oversized footprint come one legged BIG FOOT ON THE MOON and the print of a sneaker come training shoe? And the same shot of a flag transversed and used on another "so called" lunar landing and the moon buggy that left no tyre tracks and the astro - nots collecting and then bringing home fake moon rocks - from a certain part of earth! etc etc etc. Roll ya eyes all ya want Cz - but do try to get with the programme. Thanks. I also provided him with the results of those previous polls, that didn't stop him from demanding them again. I've asked him, given that truth is based on evidence NOT on popularity polls, what he thinks he'll achieve, but he hasn't answered that simple question. I don't think he's here to have a grown up debate, but given my previous warning about trolling I would suggest that he starts VERY soon. I do not think it is our job to search the net trying to locate the pictures you claim prove your point the moon landings were faked. I know I am starting to sound like a broken record seeing as you have been told countless of times to provide evidence. If you have nothing constructive to add to your argument then I suggest you move on.